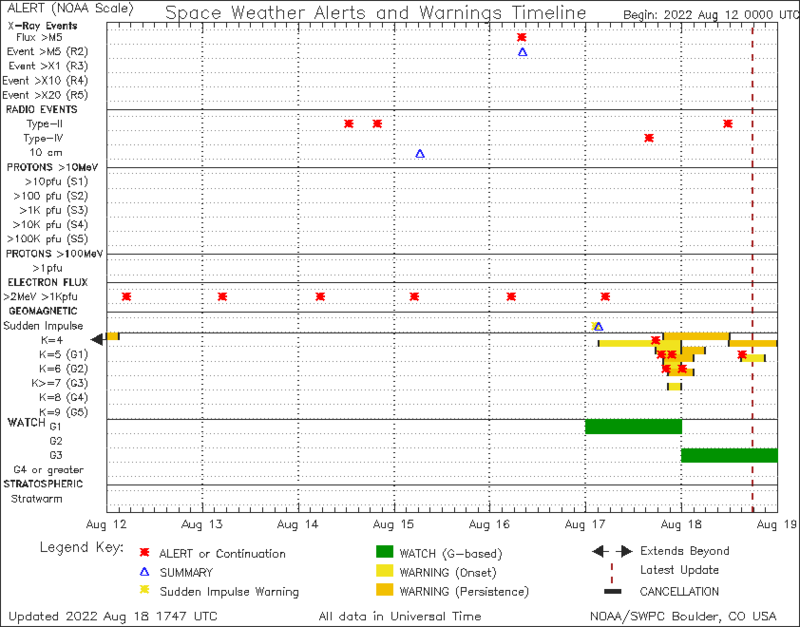 The Alerts Timeline is a graphical presentation of the Space Weather Alerts issued by SWPC, that give forecasters and users alike a quick look at the Alerts and warnings issued over a ten day period. There are two plots, each depicting seven days of time. The top plot displays seven days, centered on the current day, showing the products issued and valid for today and the next three days. The bottom plot displays the last six days plus the current day, showing the products issued over the past week. Because of the unique characteristics of these different kinds of space weather events, and our ability to detect or describe certain aspects of them, specific rows in the plot will only contain the symbols that correspond to the proper products for that phenomena. There is also a general order of precedence controlling which symbols are plotted "on top" of others. 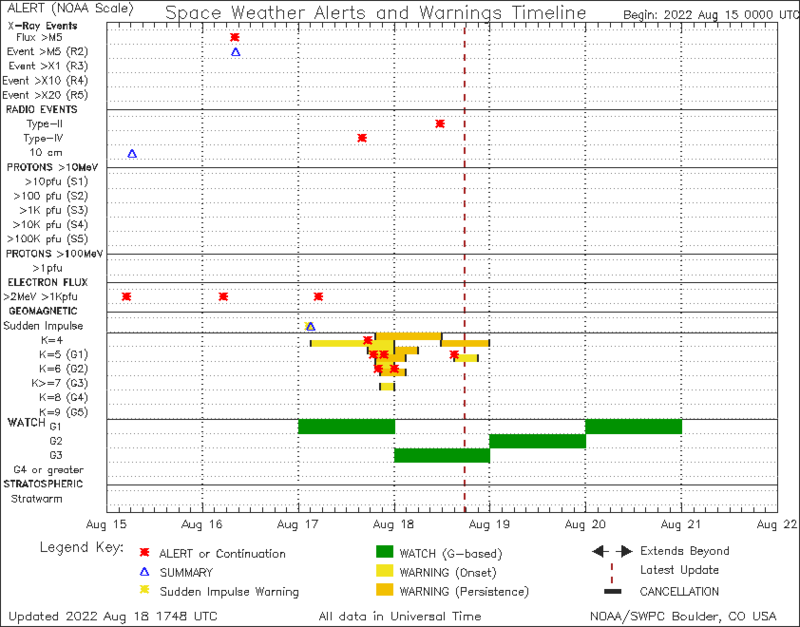 Onset and/or Persistence WARNINGS are often extended several times over the course of a space weather event. To aid in the interpretation of the product timeline for these warnings, they are bars plotted in a staggered up-down fashion along individual rows, and include black "bookends" to indicate their effective start and end times. All initial warnings are plotted for their "Valid From - Valid To" times, while all Extensions are plotted for their "Issue Time - Now Valid Until" times (Extended Warnings always have the same "Valid From" time as the initial warning, and may only be issued prior to the expiration of the latest valid warning period in effect). Warnings may have valid periods that extend before or after the time shown in the plot, and in these cases an arrow symbol appears at the appropriate end of a row in the plot. There are Archived Alert Timelines showing a graphical history of SWPC Alerts issued since February 2002. SWPC maintains an archive of SWPC products, including Alerts and Warnings. Also available are the NOAA Scales description.